You won’t miss the canned vegetables from this original recipe! Using kale instead of canned green beans adds a fresher flavor. Swapping onion for shallots and white wine vinegar for apple cider vinegar ensure a bright pop of flavor. You’ll get the original pimiento taste from this medley when you serve these greens on top of pimiento cheese grits! Heat olive oil in a large pan over medium heat. Add garlic, shallots, salt and pepper. Cook, stirring until fragrant, approximately 2-3 minutes. While the garlic and shallots cook, wash and strip kale from stems. Remove the pan from heat and slowly add the vinegar to the garlic/shallot mixture. Return the pan to heat and add washed and torn kale to the pan one handful at a time. Stir until the kale starts to wilt. Repeat with the remaining kale in two more batches. Add a pinch of cayenne if desired. Cover and cook, stirring often until tender, approximately 8-10 minutes.Remove the warmed pimiento cheese grits from the oven. 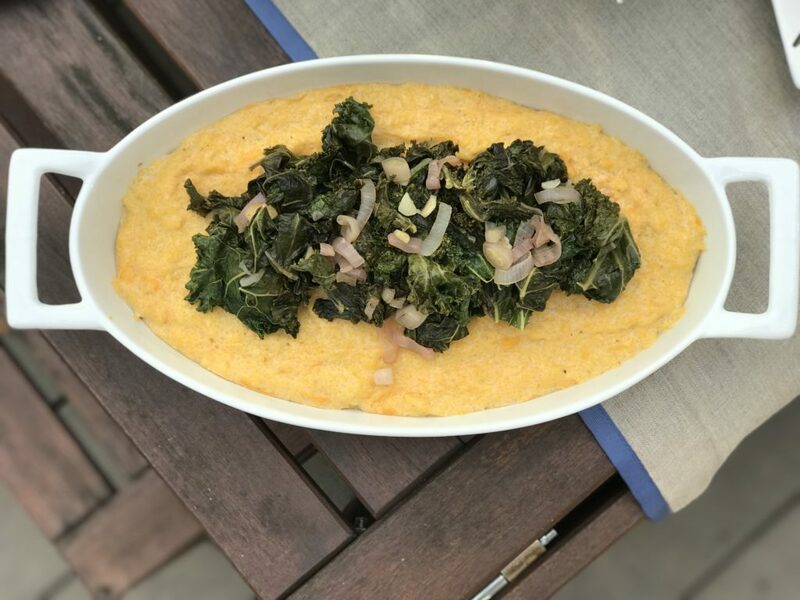 Top grits with wilted greens before serving.